The Birth Story of Link Blount Pelto! On February 7th, I started noticing that my contractions were becoming stronger and closer together, yet there were consistent intervals of time in between. I went to two out of three classes and took my exam as planned while having 3 contractions just in that one class. When I got home that evening I noticed that my water was leaking, which caught me a bit off guard. I ate dinner (Buitoni-for-2 made by Jorma) and went off to bed. I would wake with each contraction and start timing them. By midnight they were steadily happening about 20 minutes apart. This went on and on and finally I got up around 5 am when they were 10 minutes apart and paged the midwife. She suggested we make our way to Raleigh which is about an hour and a Half drive from our home in Greenville. From Raleigh we are only 30 minutes from The Women's Birth and Wellness Center in Chapel Hill. So we packed the car and took off at about 6:30 AM. We spent a good amount of time laboring at Jorma's parents' house where we watched episodes of Lost and Up All Night, took a nice hot shower (while Jorma watched Workaholics), and had lunch outside. We also took our last belly shot at 38 weeks and 6 days! When contractions were 4 minutes apart for an hour, our midwife Emily told us to head on over to the center. That car ride was a bit more intense than the last. In the 25 minutes I had about 4-5 contractions and Jorma was obviously too busy driving so he couldn't put counter pressure on my back. We made it anyways and Emily checked me and said I was 6 centimeters dilated upon arrival at about 2:45 PM. Then I started to get to the tough part! Contraction after contraction Jorma was there with words of encouragement, love and awesome massages. There is absolutely no way I could have gone all natural without his help. 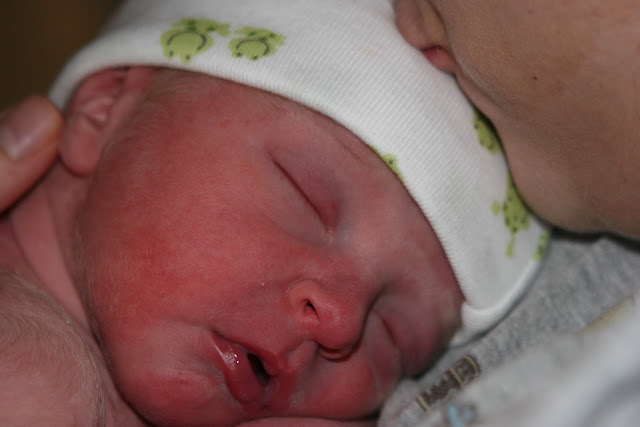 Emily was also a wonderful midwife and kept suggesting ideas of comfort that I would try (some better than others). Kamie arrived to the center at about 3:30 PM just in time to see me soaking in the awesome large bath tub! Having Jorma and Kamie AND sometimes Emily there to rub my back or just encourage me helped a ton. I wouldn't respond much but in my mind I was thankful. Once hard labor began the contractions were very difficult to stay relaxed through. My breathing would sometimes turn into hyperventilating, which meant trouble. During the pushes I have to admit, the hyperventilation and pain made me think I was having a panic attack! But of course Jorma was there, right behind me in the tub, to calm me and remind me I needed to breath deep to gain control. After what seemed like an eternity of pushing in the tub, I finally gained enough strength to move him on out and into the world. With my hands on his head I had the final pushes and Link came up perfectly clean with eyes wide open! Hardly a cone head and beautiful in every way. He was placed on my chest where Jorma stared in awe and I caught my breath and tried to realize what was happening! Link was so calm and interested when he came out and only cried for a split second. 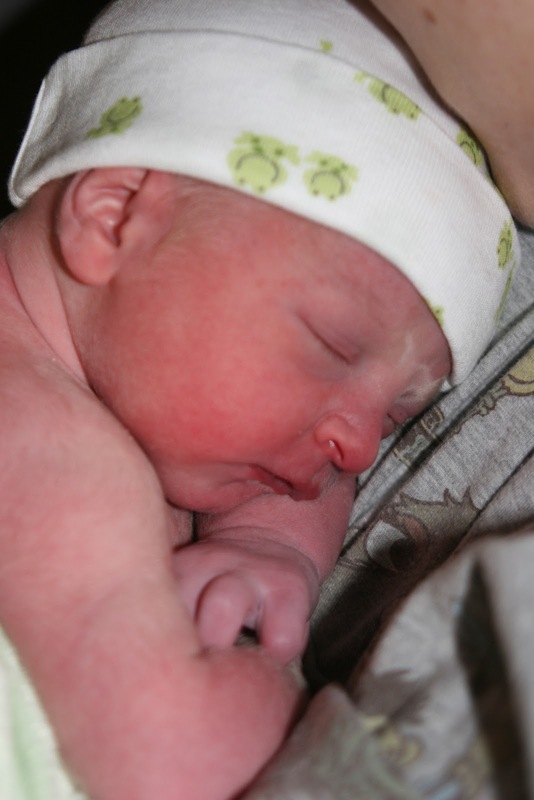 He was born on February 8th at 6:19 PM, 7 pounds and 19 inches of perfection. 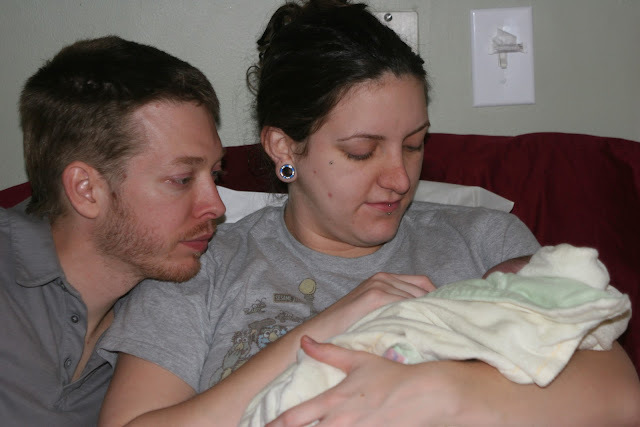 Once I was back to reality and the cord stopped pulsing Jorma was able to cut it and free Link from my womb for good! He then got out of the tub with Link and dried off while i was able to clean myself up a bit and become human again. The midwives were so impressed by our labor and delivery they said they wish it was documented to show at the Center's tours! Apparently the delivery was quick, clean and as perfect as our baby boy. Link never did cry even through all the visitors and commotion (not until the newborn exam that is, but with good reason). Even on the long ride home he was quiet and just observed the world as it went by. We ended the visits with some of Lydia's awesome cupcakes and sang happy birthday to Link! We left the center late around 11:45 PM and headed to Raleigh to pick up Susi and then straight home to Greenville! We arrived home at 2:00 AM, fed Link a little and passed out for the night with little Link sleeping next to us in our bed! What a wonderful and rewarding way to end a day full of hard work (comparable to a 50 mile hike in one day)! We have been home 2 full days now and Link is doing perfectly! He even let's us sleep a decent amount at night. I am healing quickly and anxious to get active again (instead of this bed rest business). Link is our pride and joy and we are truly overwhelmed with love. There is no greater gift then having our Perfect Pelto Pod complete!